I’ve named another cycling loop near our place; Cowling Road Loop. 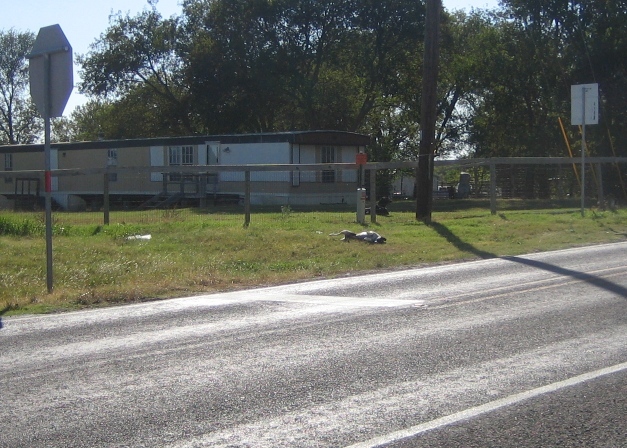 Cowling Road is an old, poorly maintained roadway that roughly parallels IH-35 south of Sanger, Texas. In this loop, Cowling Road approximately represents the southeastern limit (in which my home is near the northwest limit). 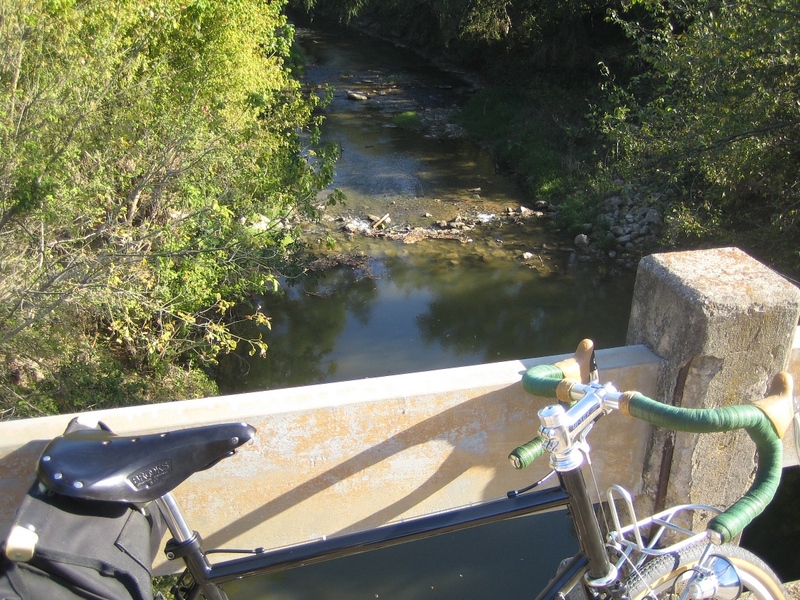 Cowling Road also crosses Clear Creek and (according to Google Earth) the bridge deck represents the lowest point of elevation of the ride at 583 feet. The highest point on this loop is probably the farthest point away from the Creek bed at 817 feet. The road in front of my house, for comparison, is at about 778 feet. Here is Clear Creek flowling lazily by on a warm, sunny Sunday afternoon. It was an early Saturday morning amble west of Ponder, Texas. Although I had the camera at the ready, the comp’ny and the surroundings were too pleasant to interrupt. No photos today. My buddy selected the route near his home and told me stories about local history and families in the area. He told me about their land and how well they managed things. I don’t recall him making a negative comment about anyone. I don’t think that is because nothing ever goes wrong. I think my friend doesn’t waste time on those things. I think he likes to celebrate the good and keep negative things from spreading. I can learn a few things from this guy. A far cry from New England, Ponder, Texas doesn’t have the same dramatic visual slap-in-face impact of the northeast part of the country. However, during the fall, this pasture dominated landscape has its own subtle beauty including the occasional brilliant color. It seems there are more colors with richer tones than at other times of the year. The gold, green, and a thousand shades of orange and brown…all in the glowing light of the autumn morning sun. Subtle as it might be, it is treasure compared to this time of year in the city. Good weather, great comp’ny. One can’t help feeling like he is one of the most fortunate. Cycling loops that I have found in every direction are affected to some degree. Most, like the one shown above, are not passable by car. 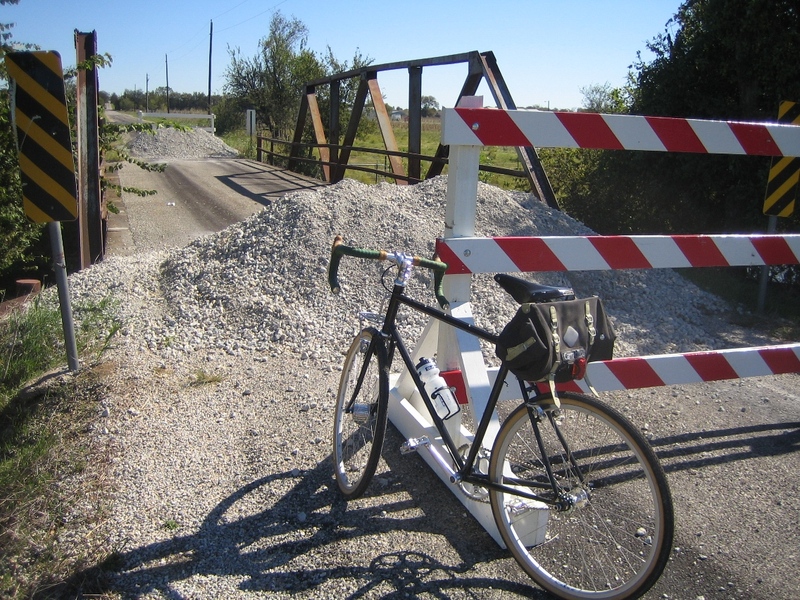 However, the adventurous cyclist can manage to cross with only a minor delay. This bridge is near our place and one that requires that I stop and walk the bike across frequently. Like the many short stretches of gravel roads nearby, it’s just one more charming thing about living in a rural area. What is it about a woman driving a tractor with a dog that personifies beauty? It makes me want to hold her tight and proclaim, “Honey, I’ve never loved you more than I do right now”. It’s no secret that we have some driveway maintenance issues. The driveway is a work in (very slow) progress. Janet found a few large-ish rocks piled up along the back fence and we figured maybe we’d put some in our driveway low spots before we bring in the next load of crushed limestone base. A little more bearing capacity was the basic line of thinking. Besides, those rocks aren’t doing much along the back fence except getting in the way of mowing. 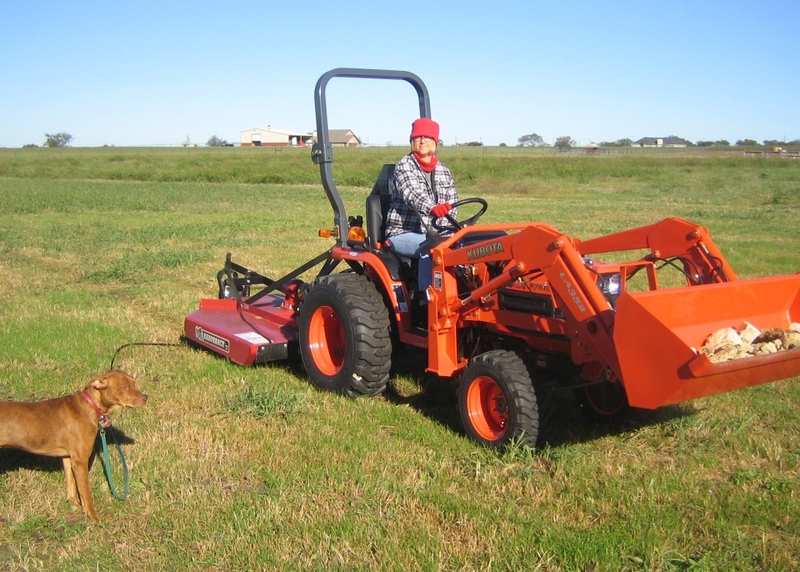 So she fires up the tractor, attaches the big dachshund, and ambles out to the rock pile. She transfers the rocks to the front-end loader and hauls them to the driveway. When I heard the rumble of the diesel on the way back, I looked out the window…and what a sight! The rest of you guys just back off. She’s incredibly attractive but, thankfully, she is all mine. My response was, “Oh yeah?…well, my bed rewards me immediately with the blessings of cozy warmth and rest without discomfort.” And so it goes…the debate that occurs countless times across the world in the minds of those who plan to wake early to pursue any purposeful activity. I know, of course, from experience that I would regret going back to sleep and letting an opportunity slip by. I know also that there often is a nice reward for a reasonable investment in cycling. Because I believed cycling’s promise, I reluctantly crawled out of bed, quickly found some warm clothes, and took my time fueling up for a ride. At 6:15 am, I rolled out the front door into 42 degree darkness and pointed my headlight into the north wind. When I start my rides northward, I gain elevation. The gradual climb, along with the brisk wind, lack of warm up time, and no gearing options, didn’t take long to render me gasping. As the road leveled and breathing returned to a more comfortable rhythm, I noticed first the burning in my still-cold legs. Then I noticed the stars and the wind blowing into my ears. It’s a little creepy out there alone on deserted county roads in total darkness. The headlight provides plenty of bright light straight down the road, but it is a rather focused beam and there is no vision to either side. When dogs bark, the only way to tell whether they are chasing is to discern whether the barks are rapidly growing louder. There can be some very uneasy moments between barks. Unlike the daylight hours, there is no way to determine if they are behind a fence or roaming and ready for the kill. Turning around brings several rewards. First, there is the change in direction so the wind becomes an ally. 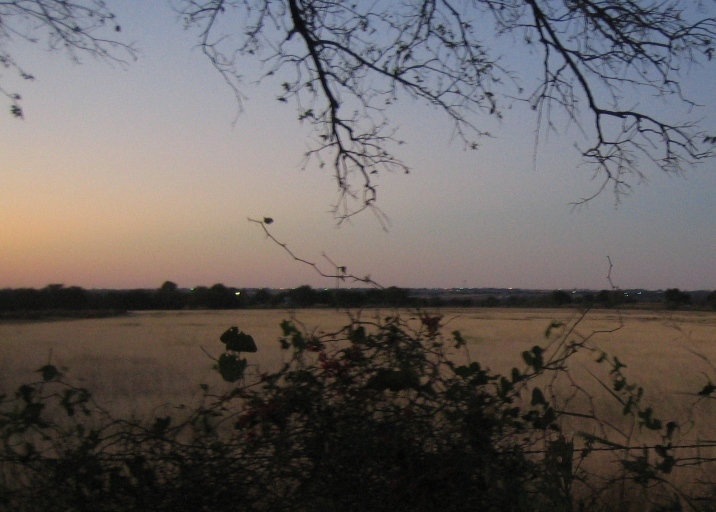 Second, light on the eastern horizon becomes evident. On chilly mornings, that orange tint lining the earth-sky interface begins to give definition to a few otherwise invisibly grey clouds. It might as well be God’s personal cheerful, “Good Morning!”, exclusively to me. Finally, while riding the wind, the ride is amazingly quiet. There is nothing, but the faint hum of tires on pavement and a few sounds from the local surroundings. Passing by one farm, the creaking of a windmill swiveling to a slight wind shift was obvious to me before it was spotted visually. By this time, the rewards of the morning ride were abundantly evident. 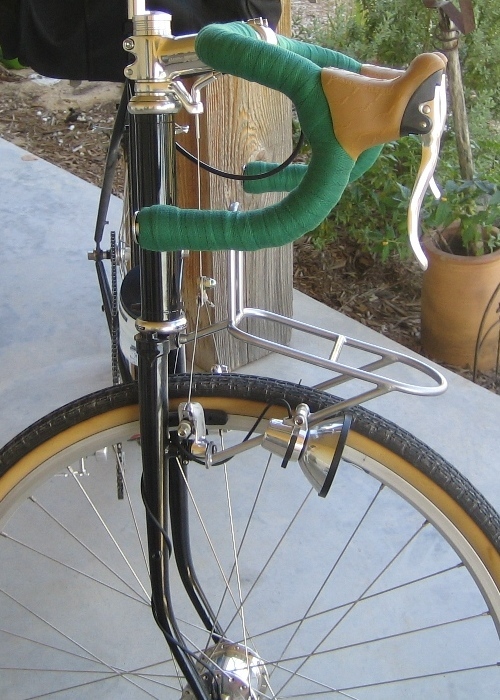 The cranks spun easily, the temperature was comfortable, and it felt good to be outside and moving. It occurred to me that cycling’s promises are similar to God’s promises. Jesus said, “I have come that they may have life, and that they may have it more abundantly.” His promise is that if we choose the minor discomfort of giving up self to submit to His ways, He will provide us a full life. To the degree that I have believed the promise and submitted to Him, I have been rewarded with rich blessings. Just like it takes a while to warm up on the bike, it takes time to adjust to more selfless living. Just like it is a little scary to pedal in the dark, it is a little scary to trust Him to lead me and and use me for His purposes. Just as that sun rises in the horizon, He encourages me and gives me strength. Then I see Him more clearly and I rejoice in His blessings. Hopefully, the trivial rewards of cycling’s promises will continue to remind me of the infinitely more valuable rewards from the promises of God. A beautiful, but windy, Sunday afternoon found me back on the bike. There have been days in the past, when speed was the objective. A strong wind in those days would have been a strong annoyance. In those days, there were strong limitations in my perspective. In these days, with perspective, each opportunity to roll out is a special privilege. Today’s ride, in addition to the training benefits, included a short visit with Miss Becky. Miss Becky, as I call her, lives at the FM 455/FM 2450 intersection. This unicorporated area is known to locals as Boliver. It is a four-way stop with a gas station/grocery on one corner. 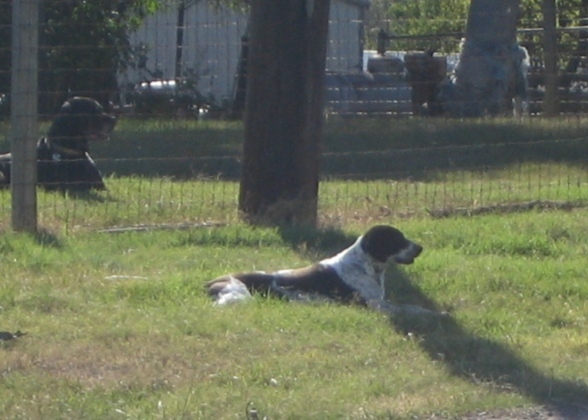 In the photo above, she’s rolling in the grass on the southwest corner. She’s homeless, but pampered. Several, including certain females in my family, have tried to rescue her. Miss Becky doesn’t want to be rescued. Those in the grocery feed her by keeping a constant pile of food laying around. It is my understanding that others have brought her food as well. During my visit today, I noticed that someone had placed about a pound of fat trimmings from some kind of barbeque. I think it was from a brisket and it smelled delicious. No sir, Miss Becky, don’t need no rescuing. This week goes down as a great example of how, without sufficient margin in life, little things can erode away important things. Many of us have schedules that are packed full. I suppose we do this because we wish to “miss” as little as possible…the old “I want to have it all” line of thinking. Maybe it is because we think that the whole world out there needs our special touch. Whatever the reason, without sufficient margin, life’s little contingencies pop-up. When they do, they usually do not displace the urgent things in our schedule. It is the less urgent, but more important things, that are nudged aside. For reasons of spiritual, emotional, and physical health, I’ve remembered the long-term importance of Bible study, prayer, and physical exercise (for me, cycling). Certain measures have been taken to re-emphasize these things and put them back in my weekly routine. The training log added to this blog (bottom of right hand column) is one visible example. Less visible examples include carving out some time daily for reading the Bible, meditation, and prayer. While things run smoothly, it feels great to balance the accomplishment of the “must be done today” things with some time to step back and sow the proverbial seeds for a future harvest. Then come the little things.